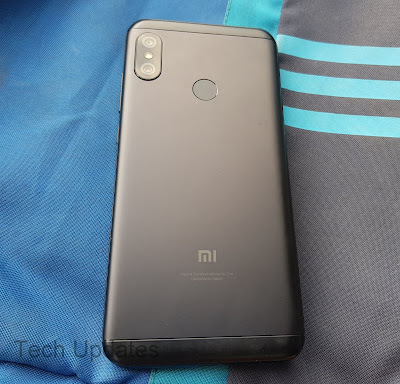 Q) How to Enable Reading Mode in Xiaomi Redmi 6 Pro? Q) How to change Text Size? A)Go to setting- Display- Text Size- Select text Size you want. Q) How to change the wallpaper? A) Go to Settings - Wallpaper- Change Wallpaper, You can also change by Press on home screen wallpaper. Q) How to enable Wireless Display? Q) How to Enable Dail pad touch tone? A) Go to Settings-Sound & Vibration- Dail Pad touch tone. Q) How to Enable or Disable Screen lock/Screen Shot sound? Q) How to launch Camera? A) To Enable Go to Settings - Lock Screen & password- launch Camera, Press Volume button Down twice to launch the camera or Swipe Right when screen locked to open the camera. Q) How to Display Owner info on Lock Screen? Q) How to Enable or Disable App Notifications? Q) How to Enable Connection speed? Q) How to Show Carrier Name? Q) How to show System Status? Q) How to change Default launcher? Q) How to Setup Fingerprint Scanner? Q)How to enable One-handed mode? Q) How to enable Game Speed booster? Q) How to Enable Full-Screen Gestures? Q) How to enable Battery Percentage? Q) How to Change Back and Menu Buttons? Q) How to Hide Notch? Q) How to enable Permissions? A) Go to settings - Permissions- enable Permissions or change Autostart apps. Enable Torch Light When Screen Locked - Swipe left you can enable Torch also use Mi home or Mi remote App. Call Recording MIUI comes with an inbuilt feature without having to install any apps. To enable this go to settings and select call recording option. Tap on “Record calls automatically” to enable this feature. You also have an option to record all numbers and selected numbers. Long screen shot-Now you can take a long screenshot of your chat/web page, just by scrolling at one go. First, take a screenshot by pressing Volume down + power button or Swipe three fingers down. Once done, open it and tap on the scroll option at the bottom and scroll down to take a long screenshot. Scheduled SMS to do this, open a new conversation page in the messaging app and tap on “+” on the left side. Now select “Timed” option and schedule it whenever you want. Power Key to Hang Up: You can hang up the call just by pressing the power button instantly. To enable this feature, you need to go to System Settings -Additional Settings -Accessibility - Turn on the “Power button ends call” switch. App Lock-Now you can apply lock separately on the Security Menu for selected apps. Tap the app lock option on the Security menu -> select the apps you want to lock -> Set the password. With this feature, you can either lock the apps separately or at one go. Second Space Go to setting then select " Second Space " turn on Second space once this is done second space will be enabled this allows users to import Data, Contacts from First space. With this, you can use one for office one for personal use. you can also delete second space. Dual App For those, who need two accounts on — WhatsApp, Facebook, and other apps, this feature will be helpful with this features called as Dual Apps, where you have the possibility of creating two accounts on the same device. To enable this, go to Settings -> Dual Apps and select the apps for which you want to make another account. The second/cloned app will come with a small second space icon for easy. Split Screen Open any app and press home button for 2 seconds, Select split-screen mode it will be activated with the current app to top pane. You can choose another app for the bottom pane from home screen or multi-tasking screen. New Notification toggles: Xiaomi has completely revamped the Quick settings and notifications toggles, the new UI looks similar to Android P.
Redesigned Volume Sliders: Xiaomi has redesigned the volume slider controls which now by default controls Media volume levels, and has a vertical slider Users can tap on silent button to put the phone on silent with a single tap and three dots below the silent button bring full volume controls on screen including Media, Ring and Alarm volume level. New Recents Menu: New Recent apps page which is now a vertical scrolling page, the recent apps page shows apps in two columns and now users can see more apps in recent apps which makes multitasking even better. On recent apps page, users can tap and hold on an app to get options to lock the app in recents, put the app in split screen mode and a settings button to open app info page which is a nice addition. Free memory status position has been moved to top right corner now and clear all app button remains at the same position as before.